I’m currently working on several gaming projects for modern browsers and Windows 8 Store projects. Some of them are using HTML5 as a base in order to simplify multi-devices targeting. I was then looking for a unified way to address all inputs on all platforms: Windows 8/RT, Windows Phone 8, iPad, Android & FirefoxOS. As you’ve maybe discovered in my previous article Unifying touch and mouse- how Pointer Events will make cross-browsers touch support easy, IE10 on Windows 8/RT & Windows Phone 8 implement the Pointer Events model we’ve submitted to the W3C. In order to address in a unified way this Pointer Events model and the one implemented in WebKit based browsers, we’re going to use David Catuhe’s HandJS library. Check out his blog’s post here: HandJS a polyfill for supporting pointer events on every browser. 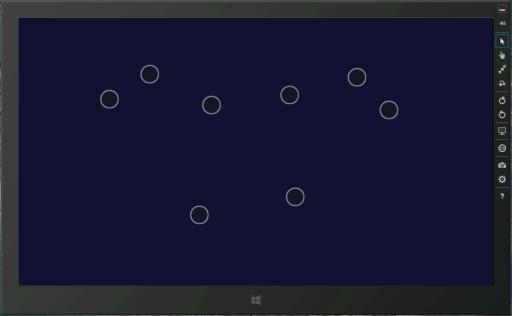 This idea is to target the Pointer model and the library will propagate the touch events to all platforms specifics. The idea was then to take his code and refactor the touch part to target the Pointer model instead of the original WebKit Touch approach. While working on that several months ago, I’ve discovered that Boris Smus from Google had already started to more or less do it. It’s been done while he was working on his own Pointer.js library as described in his article Generalized input on the cross-device web. However, at that time, Boris was mimicking an old version of the IE10 Pointer Events implementation and his library wasn’t working in IE10. That’s why, even if Boris’ work was awesome, we’ve decided to work on our own version. Indeed, David’s library is currently targeting the last and very recent W3C version currently in last call draft. If you’re having a look to both librairies, you’ll see also that HandJS is using some different approaches in several parts of the code. We will then use HandJS in this article to build our touch joystick. Thanks to Hand.js, we’re going to make it compatible for all browsers. It’s even also going to track the stylus and/or the mouse based on the type of hardware you’re currently testing on! The same webpage provides the very same result under Chrome on Windows 8 or on an iOS/Android/FirefoxOS devices (except that pen is only supported by IE10). Thanks to HandJS, write it once and it will run everywhere! This sample works fine on a Windows 8/RT touch device, a Windows Phone 8, an iPad/iPhone or Android/FirefoxOS device! If you don’t have a touch device, HandJS will automatically fallback to mouse. You should then be able to track at least 1 pointer with your mouse. // resize the canvas - but remember - this clears the canvas too. //make sure we scroll to the top left. Well, I think the code is pretty straightforward. I’m registering to the pointerdown/move/up event like described in my introduction article on MSPointer Events. In the pointerdown handler, I’m catching the ID, the X & Y coordinates and the type of pointers (touch, pen or mouse) inside an object generated on the fly pushed in the pointers collection object. This collection is indexed by the id of the pointers. The collection object is described in Collection.js. The draw() function is then enumerating this collection to draw some cyan/red/lime circles based on the type at the exact position where you’re touching the screen. It also adds some text on each circle’s side to display the pointer’s details. The pointermove handler updates the coordinates of the associated pointer in the collection and the pointerup/out simply removes it from the collection. Hand.JS makes this code compatible for IE10 by propagating pointerdown/move/up/out to the associated MSPointerDown/Move/Up/Out events and to the touchstart/move/end events for WebKit’s browsers. Otherwise, you will only be able to move the ship using your mouse by clicking on the left of the screen or firing by clicking on the right side, but you won’t be able to achieve both actions simultaneously. Indeed, HandJS is providing a mouse fallback if the browser or platform doesn’t support touch. Note: the iPad seems to suffer from an unknown bug which prevents this second iframe to work correctly. Open the sample directly in another tab to make it works on your iPad. In conclusion, thanks to the job done by Seb Lee-Delisle and David Catuhe, you now have all the pieces needed to implement your own virtual touch joypad for your HTML5 games. The result will work on all touch devices supporting HTML5! 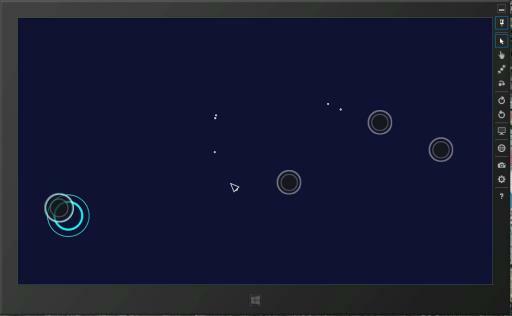 Nice work, but have you noticed that in TouchControl.html that the ship will pause while moving and firing while using an ipad? To recreate, start by deflecting the left joystick to move the ship. Next begin firing with right taps. Notice the ship will remain stopped until the left hand moves event the slightest. As long as the left thumb is still down but in its originally deflected position the ship remains stationary. This is awesome, I just tested it on the Acer Iconia W700 i5. The original is a bit slow, but the iPad version works just fine. is this up to date? has someone implemented as a nice virtual joystick?